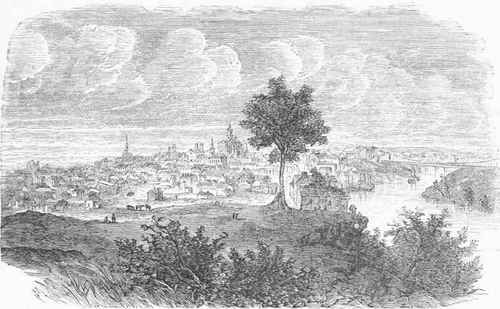 Nashville, a port of delivery and the capital of Tennessee, seat of justice of Davidson co., the second city of the state in point of population, situated on the S. bank of the Cumberland river, 200 m. above its junction with the Ohio, a little N. of the centre of the state, and 240 m. S. S. W. of Cincinnati; lat. 36° 10' N., Ion. 86° 49' W.; pop. in 1830, 5,566; in 1840, 0,929; in 1850, 10,165; in 1860, 10,988; in 1870, 25,865, of whom 9,709 were colored and 2,809 foreigners. The river bluffs are here rocky, and rise 70 or 80 ft. above low-water mark. The land on which the city is built is irregular, rising in gradual slopes, with the exception of Capitol hill, which is more abrupt. This eminence is symmetrical, resembling an Indian mound, and overlooks the entire city. Nashville is regularly laid out, with streets crossing each other at right angles, but mostly rather narrow. It is generally well built, and there are numerous imposing public and private buildings. One of the finest of the former is the capitol, situated on Capitol hill, and constructed inside and out of a beautiful variety of fossiliferous limestone. It is three stories high including the basement. At each end there is an Ionic portico of eight columns, each 4 ft. 0 in. in diameter and 33 ft. 5 in. high, and each of the sides has also a portico of six columns. A tower rises above the centre of the roof to the height of 200 ft. from the ground. It has a quadrangular rusticated base, 42 ft. high, surmounted by a circular cell 37 ft. high and 20 ft. 8 in. in diameter, with eight fluted Corinthian columns, designed from the clioragic monument of Lysicrates at Athens. The dimensions of the whole building are 239 by 138 ft., and it cost nearly $1,000,000. It is approached by four avenues which rise from terrace to terrace by broad marble steps. The edifice is considered one of the handsomest public buildings in the country. The court house is a large building on the public square, with an eight-columned Corinthian portico at each end, and a four-columned portico at each side. The market house, also on the public square, is a fine building. The county jail is a substantial structure of stone. The state penitentiary buildings, also of stone, occupy three sides of a hollow square enclosed by a massive stone wall, within which are numerous workshops. The Hermitage, the celebrated residence of Andrew Jackson, is 12 m. E. of Nashville. The city has several lines of street railway. Nashville has one large cotton factory, operating in 1875 400 looms and 13,840 spindles, and employing 325 hands; in 1874 it produced 2,628,907 yards, chiefly sheetings. There are seven saw mills, five flour mills, eight planing mills and sash and blind factories, two cottonseed oil mills, two tanneries, two manufactories of chairs, four of furniture, three of wagons, four of carriages, one of cedar ware, one of fertilizers, several of mattresses, saddletrees and trunks, brooms, shoes, and clothing, six found-eries, six machine shops, two brass founderies, a brewery, distilleries, and paper mills. There are four national banks, with an aggregate capital of $900,000, a savings bank, and three fire and three life insurance companies. - The city is divided into 10 wards, and is governed by a mayor and a board of aldermen of one member and a common council of two members from each ward. There is an efficient police force and a well organized fire department. The receipts into the city treasury for the year ending Oct. 1, 1874, were $450,535 80; disbursements, $461,599 11; city debt, $1,630,-506 22; assessed value of property, $13,355,281, embracing about two thirds of the property of the city. The principal charitable and reformatory institutions are the state institution for the blind, several hospitals, two orphan asylums near the city, the city workhouse, and a house of industry for females. About 6 m. from the city is the county poorhouse, and about the same distance the state hospital for the insane. Nashville is the seat of several important educational institutions. The university of Nashville was incorporated in 1785 under the name of Davidson academy, and in 1806 as Cumberland college; it received its present title in 1826. The literary department was united in 1855 with the " Western Military Institute," and was conducted on the military plan until the breaking out of the civil war. After its close the Montgomery Bell academv, an endowed institution, was united with it. The main building is a handsome Gothic edifice of stone. In 187:5-4 there were 9 instructors, 179 preparatory and 44 col-le-riate students, and a library of 11,000 volumes. The medical department, opened in 1850, also occupies a fine building; it has an extensive museum, and the charge of a miner-alogical cabinet of 20,000 specimens collected by Dr. Gerard Troost. The number of instructors in 1873 '4 was 10; of students, 235. The funds and property of the university amount to $300,000. Fisk university was established in 1806 by several northern gentlemen for the colored youth of the state. The course embraces the common and preparatory branch-as well as those of collegiate grade. The number of instructors in 1873 - '4 was 13; of students, 424. The Tennessee Central college (Methodist), also for colored people, was established in 1860, and in 1873-4 had 8 professors and 28 students; it embraces academic, normal, preparatory, collegiate, and theological departments. The Tennessee college of pharmacy, organized in 1872, in 1873-4 had 5 professors and 20 students. The buildings of Vanderbilt university, named in honor of Cornelius Vanderbilt of New York, who gave $500,000 for its establishment, are in course of erection. It is under the control of the Methodist Episcopal church, South, and is intended to comprise theological, law, medical, and literary and scientific departments. Other educational institutions are a young ladies' seminary, a select school, and the following under the control of the Roman Catholics: St. Cecilia's academy for young ladies, St. Bernard's academy, and a parochial school. The public schools are graded, embracing a high school department, and are in a flourishing condition. The number of children between 0 and is years of age in 1873-'4 was 8,877; number enrolled in public schools, 3,050 (2,820 white and 830 colored); average attendance, 2,520; number of teachers, 70; total expenditures for school purposes, $75,170 53, of which 81 l,000 was for permanent improvements, and 848,180 25 for teachers' salaries; number of school houses, 0 (1 for white and 2 for colored children); number of sittings, 3,345; value of school property, $141,000. The state library the capitol has 20,000 volumes and 5,000 pamphlets, and the city library 0,000 volumes There are two daily, two tri-weeklv, and eleven weekly newspapers, and nine monthly and two quarterly periodicals. There are 34 churches, viz. : 6 Baptist (3 colored), 3 Christian (1 col-ore), 1 Cumberland Presbyterian, 3 Episcopal, 1, German Lutheran, 2 Jewish, 5 Methodist Episcopal (1 German), 7 Methodist Episcopal, South,4 Presbyterian, and 2 Roman Catho-lic - the first permanent settlement at Nash-ulle was made in 1779-'80, and the town was incorporated in 1784, and received a city charter in 1806, The state. Mature met here from 1812 to 1815 inclusive, when it was transferred to Murfreesboro; but since 1820 it has sat at Nashville, which was made the permanent capital of the state by a legislative act of 1843. In July, 1850, a convention of delegates from several of the southern states was held in Nashville, at which secession was openly urged. In February, 1802, the city was the headquarters of the confederate general A. S. Johnston, while he was awaiting the result of Grant's operations against Fort Donel-son. When tidings came that the fort had been captured the legislature was in session; it was immediately adjourned by the governor to meet at Memphis. It was Sunday; the churches were deserted, and the streets were piled up with property for removal. Johnston hastily abandoned the city, which was given over to the mob, and a scene of general plunder ensued. The Union forces moved upon Nashville, which was entered without opposition by a detachment under Gen. Buell, Feb. 20, Grant arriving the next day. Andrew Johnson was appointed military governor of Tennessee, March 5, and reached Nashville on the 12th. The common council refused to take the oath of allegiance, and were removed; the mayor was placed under arrest, and the press put under military supervision. During the ensuing summer several unsuccessful attempts were made by the confederates to regain possession of the city. In November, 1804, Gen. Thomas being in command of the Union army of Tennessee, Gen. Hood, who had succeeded Gen. J. E. Johnston and lost Atlanta, commenced an invasion of that state. Gen. Schofield, with a large Union division, fell back. He was overtaken at Franklin, 18 m. S. of Nashville, and a severe action ensued, Nov. 30. The confederates assaulted the Union intrenchments and were repulsed, losing 4,500 men according to Hood's account, or about 0,000 according to Schofield's estimate. Schofield then joined Thomas at Nashville, which was strongly fortified. Hood followed, and early in December intrenched himself in front of the Union lines. On the 15th Thomas made an attack in force and drove the enemy from their works. During the night Hood took up another position, where he was attacked by Thomas in the afternoon of the 10th. The confederates were driven off in almost total rout; but night coming on, the pursuit was suspended. It was resumed on the next day, mainly by cavalry. Hood maintained a strong rear guard, and succeeded, after several sharp skirmishes, in reaching the Tennessee river, which he crossed on the 27th. No trustworthy reports have ever been made of the losses in these actions. Thomas puts his loss in killed, wounded, and missing during the entire campaign at about 10,000. He states that he took 13,189 prisoners; the confederates lost several thousands by desertion; and their entire loss was probably nearly 25,000, besides 72 guns and a large number of small arms. For all practical purposes their array was entirely broken up, and Hood was removed from command Jan. 23, 1865.